COCOA BEACH, Florida -- U.S. Congressman Bill Posey (R-FL) has filed a bill in the U.S. House of Representatives on February 1, 2013 to designate the facility of the United States Postal Service located at 500 North Brevard Avenue in Cocoa Beach, Florida, as the `Richard K. Salick Post Office'. Richard Salick was a locally well-known National Kidney Foundation Surf Festival organizer and former professional surfer who died on July 2, 2012. 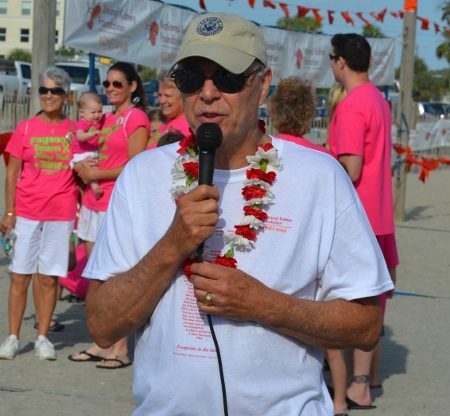 PICTURED ABOVE: Donning a Hawaiian Lei and sunglasses, Posey helped kick-off a 5K Kidney Beach Walk sponsored by the National Kidney Foundation (NKF) of Florida and organized by Richard Salick as a tribute to organ donation. The walk took place in last May at the Cocoa Beach Pier in Cocoa Beach Florida. “Congressmen Posey’s support of this cause makes him the perfect candidate to kick-off what is sure to become a tradition,” said Richard Salick during last year's event.